Plascore provides a full range of certified deformable barriers, crushable core, as well as custom honeycomb configurations for a wide array of energy absorption applications. The company’s aluminum honeycomb core is an ideal energy absorber. It has a high crush strength to weight ratio, a linear force curve with a constant load, and it absorbs energy over a long stroke. Just ask the students at Western Michigan University (WMU) in Kalamazoo, Michigan. Racing from the bottom of the pack to the top half in a matter of three years, the WMU Formula Racing Team competes among the top schools in the world, making a mark in the world of SAE (Society of Automotive Engineers). 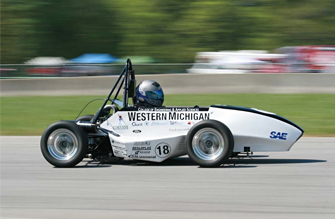 Comprised of 20 engineering students, the WMU Formula Racing Team designs and manufactures a small formula-style race car each year, starting from scratch. The team races in Formula SAE events sanctioned by the Society of Automotive Engineers International, and in Sports Car Club of America (SCCA) events. The opportunity allows engineering students to apply what they learn in the classroom to a hands-on project. Events are held across the country, including Formula SAE Virginia and Formula SAE Michigan; Sports Car Club of America (SCCA) Solo autocross; two Northwest Ohio Region events and the Great Lakes Divisional Championship in Peru, IN. WMU closed out the 2009 season as one of only five Formula SAE teams at the 2009 Tire Rack SCCA Solo National Championships in Lincoln, NE. The rules and regulations sanctioned by SAE are heavily based on vehicle safety. A major criteria is the requirement of an impact attenuator (essentially the car’s front bumper). The impact attenuator has to give an average deceleration of the vehicle, not to exceed 20g’s with a peak of less than 40g’s when run into a barrier with a velocity of 7 m/s at impact. That is where WMU Formula Racing turns to its partnership with Plascore. The team began working with Plascore in 2007 to take advantage of the lightweight energy absorption honeycomb technology. WMU alumni Brian Doorlag stated, “I was impressed with the certified crush strength of Plascore’s honeycomb. When designing our impact attenuator, I just had to do some simple engineering calculations, and our test results would come out to nearly exactly what we calculated based on the tolerances outlined by Plascore.” At the Formula SAE events, the team receives a grade based on their reports detailing the engineering of their impact attenuators. Last year, WMU received near perfect marks for their use of Plascore honeycomb in their design.